Composer, multi-instrumentalist, educator, and record label enterpreneur Vinny Golia discusses his unlikely entrance into improvised music, going from his cover artwork for albums by Chick Corea (The Song of Singing), Joe Henderson, and Dave Holland / Barre Phillips (the seminal Music From Two basses), to his acquisition of a Selmer Mark VI soprano saxophone, replete with metal mouthpiece to match the setup of his idol John Coltrane. He then goes on to discuss some experiments in Grand Central Station, his emigration to the west coast, and the gradual expansion of his staggerinly diverse collection of woodwind instruments. He discusses the development of his improvisational and compositional style, and his recent set of recordings featuring compositions for Like Instruments (one CD each for music featuring flutes, clarinets, Eb saxohpones, and Bb saxophones). He discusses his work with his record label Nine Winds and his stint curating half of April’s concerts at The Stone in New York. Also included are a handful of duo improvisations with host James Ilgenfritz. As a composer Vinny Golia fuses the rich heritage of Jazz, contemporary classical and world music into his own unique compositions. Also a bandleader, Golia has presented his music to concert audiences in Europe, Canada, Mexico, Japan, Australia, New Zealand and the United States in ensembles varying dramatically in size and instrumentation. Mr. Golia has won numerous awards as a composer, including grants from The National Endowment of the Arts, The Lila Wallace Commissioning Program, The California Arts Council, Meet the Composer,Clausen Foundation of the Arts, Funds for U.S. Artists and the American Composers Forum. In 1982 he created the on-going 50 piece Vinny Golia Large Ensemble to perform his compositions for chamber orchestra and jazz ensembles. Vinny has been a featured performer with Anthony Braxton, Henry Grimes, John Carter, Bobby Bradford, Joelle Leandre, Leo Smith, Horace Tapscott, John Zorn, Tim Berne, Bertram Turetzky, George Lewis, Barre Phillips, The Rova Saxophone Quartet, Patti Smith, Harry “the Hipster” Gibson, Eugene Chadburne, Kevin Ayers, Peter Kowald, John Bergamo, George Gruntz Concert Jazz Band, Misha Mengelberg, Han Bennick, Lydia Lunch, Harry Sparrney and the Los Angeles Philharmonic Orchestra amongst many others. He currently teaches at California Institute of the Arts. Trumpeter Nate Wooley speaks about his upcoming projects as Artist In Residence at Issue Project Room and his projects with longtime collaborators like Paul Lytton and C. Spencer Yeh, as well as his work with amplified trumpet in a more noise -based sonic environment, and his work in three great contemporary jazz quintets: those of saxophonist Matt Bauder, drummer Harris Eisenstadt, and his own quintet: an ensemble whose instrumentation mirrors the iconic ensemble of Eric Dolphy’s Out To Lunch album. He discusses the influence of trumpeters Ron Miles and Herb Robertson, recent developments in trumpet lineage and the antecedents to the current renaissance of creative trumpet music. 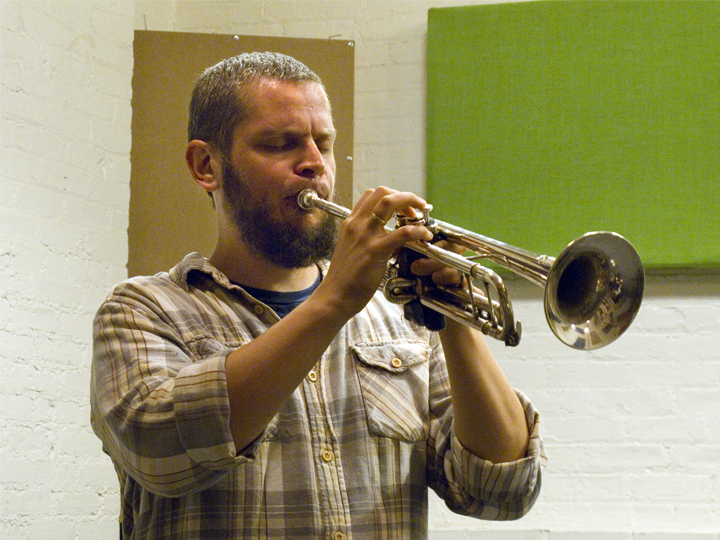 Nate Wooley is a relative newcomer to improvised music circles, breaking into that public’s consciousness with his solo recording, “wrong shape to be a storyteller” (Creative Sources Recordings) two years ago. Growing up in a small fishing town in Oregon, Nate got a solid jazz education from his father in a northwest coast dance band, but eschewed the tradition of jazz trumpet to concentrate on extreme sound, touring and recording with such hard noise and rock groups as Melee, Graveyards, and Akron/Family. He has performed and recorded with such jazz figures as Anthony Braxton, John Zorn, Joe Morris, William Parker, John Butcher, Ned Rothenberg, Ikue Mori, and Steve Beresford. Clarinetist, composer, and producer Jeremiah Cymerman discusses his approach using his concepts about sound engineering to integrate composition and improvisation. He discusses the development of his concept of recording studio engineering as a compositional device when creating his Tzadik release “In Memory of the Labyrinth System” (see also his recent article in Tape Op), and talks about solo improvisation, and his recent Jerome Foundation commission, premiered at Roulette in 2010 and featured on his recent release”Under a Blue Grey Sky” (Porter Records). Duo improvisations feature Cymerman on clarinet and host James Ilgenfritz on double bass and electric bass guitar. Jeremiah Cymerman (pronounced simmer-man) is a composer and clarinetist based in New York City since 2002. 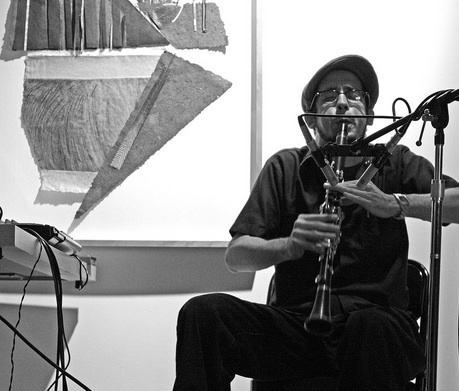 He has been active in a wide variety of musical contexts and has been honored to present his work in some of New York City’s most highly regarded venues for avant-garde and experimental music including Roulette, The Stone, Issue Project Room, Anthology Film Archives, and Washington Square Church. Described by Time Out New York as “one of downtown’s most inventive and resourceful composer-performers” Cymerman has worked with a broad range of contemporary artists including Otomo Yoshihide, John Zorn, Jandek, Ned Rothenberg, Ikue Mori, Evan Parker, Peter Evans, Jessica Pavone, Toby Driver, Lawrence D. “Butch” Morris, Trevor Dunn, Anthony Coleman, Nate Wooley, Mary Halvorson, and Matthew Welch, among many others. Multi-instrumentalist and composer Elliott Sharp discusses recent projects that represent the latest developments in the disparate threads that run through his decades-long career, from solo performance to avant-techno to lush film scores. Sharp is most known in the United States as an innovative maverick guitarist, though as a composer he has been experimenting for decades with graphic notation and unusual improvisational structures, often taking inspiration from Benoît Mandelbrot’sbook on fractal geometry, as well as flexagons and other mathematical or geometrical constructs. Excerpts from recent releases illustrate some of his theories, including the CDs Octal 2, Abstraction Distraction, and The Spectropia Suite, Sharp’s soundtrack for Toni Dove‘s interactive multimedia project titled Spectropia. Notorious New York composer, conceptualist, and multi-instrumentalist Elliott Sharp has maintained a diverse creative output throughout his career. Since his arrival in New York in the late 1970s, he has been operating in unusual settings, releasing music by his avant-rock project Carbon on the seminal 1980s punk label SST, then on various labels associated with the Downtown scene in New York. His work includes decades of innovative re-grooving of the rock format, visionary new classical music for string quartet, orchestra, and opera, completely unorthodox electronic dance music (TECTONICS), Delta blues meets free-rock (TERRAPLANE), and many improvisational encounters with the most diverse musicians of the world, from Nusrat Fateh Ali-Khan to Michiyo Yagi, from Frances-Marie Uitti to DJ Soulslinger, and finally, loving interpretations of Thelonious Monk without the clichés. Saxophonist and bass clarinetist Andrew D’Angelo discusses creativity and plays a set of engaging improvisations in a trio with guitarist Jonathan Goldberger and bassist James Ilgenfritz. Contemplating the performer’s relationship to their own inner creative energy, D’Angelo poses the question, “Who is the one doing the creating?”. On Friday, January 25, 2008, D’Angelo suffered a major seizure while driving in Brooklyn. In the wake of his dramatic battle with brain cancer, D’Angelo experienced transformative growth and has deepened his connection to his own inner creator. Lately, D’Angelo has been sharing his thoughts on this pursuit with younger musicians in Brooklyn and overseas. In conversation with James Ilgenfritz, D’Angelo recalls workshops from the first part of 2010, and talks about how free improvisation and the process of teaching his compositions to young aspiring improvisers has helped shape his outlook on creativity. Andrew D’Angelo’s charismatic presence and iconoclastic musical ambition have been well-established over the course of his twenty year plus career and his key roles in bands like Human Feel, the Matt Wilson Quartet and Tyft. His dedication to pushing his limits and his willingness to delve into new musical areas have been powerful inspirations to his peers and to a new generation of improvisors. His forceful tone and aggressive improvisational style have made him one of the most influential alto saxophonists of his time. Saxophonist and composer Matana Roberts speaks with James Ilgenfritz about the technical and metaphysical aspects of her dynamic and highly autobiographical music, including her ongoing blood narrative project Coin Coin (documented on her blog In the Midst Of Memory as well as an upcoming record on the Canadian label Constellation, and the interactive nature of her site-specific solo work. During the many years Roberts has been busking in New York and many other cities, she has come to see the process as an interactive dialogue with architecture. Roberts also discusses her early years in Chicago, including her association with the AACM and the support from Chicago elders like Fred Anderson an contemporaries like Josh Abrams and Chad Taylor. She also discusses her ongoing self-published Zine, “Fat Ragged”, and her enthusiasm for the transformative power of youth outreach, specifically describing recent work with ICASP in Montreal and The Future of Music Coalition and Air Traffic Control in New Orleans. Roberts and host James Ilgenfritz also perform duo colorful and engaging duo improvisations. Chicago born and bred, Matana [pronounced [mah-tah-nah] Roberts is an alto saxophonist/composer/performer who works in various mediums of improvised sound and performance, and has been active in New York since 2001. A Vanlier and Brecht Forum fellow, as well as a 2008 and 2009 nominee for an Alpert Award in the Arts, She has appeared as a collaborator on recordings and performances worldwide with her own ensembles as well as with a variety of collaborative ensembles—such groups as Sticks and Stones, Burnt Sugar, Exploding Star Orchestra, the Oliver Lake Big Band, the Julius Hemphill Sextet, Myra Melford’s Happy Whistlings, Jayne Cortez’s Fire Spitters, Merce Cunningham Dance and Savion Glover Dance. In 2008, the success of her leader debut, The Chicago project (Central Control International ), led critics to call Ms. Roberts “one to watch” (Kevin Legendre, Jazzwise) and “an eloquent, dramatic, tone warping free jazz artist right out of Ayler’s anti bop tradition.”( John Fordham, London Gaurdian) She has also recorded as a side woman on recordings with a large smattering of influential ensembles such as Godspeed You Black Emperor, TV on the Radio, Savath and Savalas, and Silver Mount Zion. Composer, improviser and deep listening proponent Pauline Oliveros discusses her more than 50 years at the forefront of experimental music, from her initial arrival in San Francisco in the 1950’s to the celebration in honor of receiving the William Schumann Award from Columbia University, and beyond. She discusses her innovations in the field of music technology, from her involvement in the San Francisco Tape Music Center to her current work with iPhones as instruments and the development of Adaptive Use Software, which enables physically challenged individuals to make improvisational music. She and host James Ilgenfritz also discuss the changes that have taken place for women composers in the 50 years since she was the first woman to receive the award for composition from the Pacifica Foundation in 1960, and the aspects of her work that incorporate gender and contemplative disciplines, including her sonic meditations, her Deep Listening practice, and the 10th Annual Women and Identity Festival, curated by Ione. Oliveros and host James Ilgenfritz also perform a number of ecclectic improvisations, with Pauline employing her Roland Digital Accordion. Pauline Oliveros, composer, performer and humanitarian is an important pioneer in American Music. Acclaimed internationally, for four decades she has explored sound, forging new ground for herself and others. Through improvisation, electronic music, ritual, teaching and meditation she has created a body of work with such breadth of vision that it profoundly effects those who experience it and eludes many who try to write about it. Whether performing at the John F. Kennedy Center in Washington D.C., in an underground cavern, or in the studios of West German Radio, Oliveros’ commitment to interaction with the moment is unchanged. Through Deep Listening Pieces and earlier Sonic Meditations, Oliveros introduced the concept of incorporating all environmental sounds into musical performance. In performance Oliveros uses an accordion which has been re-tuned in two different systems of her just intonation in addition to electronics to alter the sound of the accordion and to explore the individual characteristics of each room. Pauline Oliveros has built a loyal following through her concerts, recordings, publications and musical compositions, and has also provided leadership within the music community from her early years as the first Director of the Center for Contemporary Music (formerly the Tape Music Center at Mills), director of the Center for Music Experiment during her 14 year tenure as professor of music at the University of California at San Diego to acting in an advisory capacity for organizations such as The National Endowment for the Arts, The New York State Council for the Arts, and many private foundations. She now serves as Distinguished Research Professor of Music at Rensselaer Polytechnic Institute and Darius Milhaud Composer in Residence at Mills College. Oliveros has been vocal about representing the needs of individual artists, about the need for diversity and experimentation in the arts, and promoting cooperation and good will among people.